Home|About the Whales|What kinds of whales will we see? 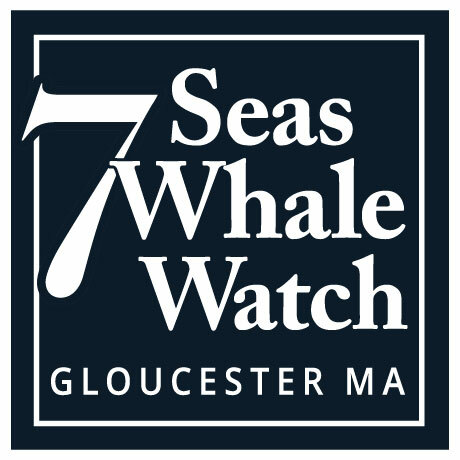 Humpbacks are the species most commonly sighted off the coast of Gloucester. They range in size anywhere from 35 up to 60 feet in length when fully grown (males are usually slightly smaller than females). Humpback whales are seen along the New England coast from March through November. They are here primarily to feed upon the abundance of fish found in the area (some of the same fish that have made Gloucester the famous fishing port that it is). But while feeding is their main activity, Humpbacks are also seen engaging in many other behaviors such as breaching (leaping out of the water), flipper-slapping, tail-breaching, and tail-lobbing. These amazing surface active behaviors have made the Humpback Whale a favorite amongst whale watchers. The Finback or “Fin Whale” is the second largest animal ever to have lived on Earth; bigger even than any of the Dinosaurs. The longest Fin Whale ever recorded was an adult female that measured 89 feet in length! Despite their great size Fin Whales are very fast and agile animals. They have been nicknamed “the greyhound of the sea” because they can swim at speeds of up to 30 miles per hour! They are also rather shy animals by nature, and this shyness combines with their fast speed can make them challenging animals to get a close look at. But when yu are able to get a good look at Fin whale you will no doubt be amazed at their size and beauty. Fin whales are also amongst the most beautifully patterned of all the world’s whales. They have an “asymmetrical” color markings in that the left side of the animal is a very dark gray, while the right side is much lighter gray or even white. These markings create swirling bands of lighter light and dark, a pattern which called a “chevron”. The chevron of each Fin whale is slightly different which enables researchers to recognize individual whales in the field. By following the movements, behaviors, and associations of individual whales throughout their lives we are able to learn about that species. Minke whale is one of the smallest of the baleen whales but “small” is a relative term. Minke whales are only “small” compared to their larger cousins the Humpback and Finback whales. They can reach adult lengths of just over 30 feet but this rare. The Minke whales we see in our area usually range in size from 15-20 feet. Minke whales are quite common and seen on most trips. Minke whales may, in fact, be the most abundant whale species in our area, but their small(er) size, fast speed, and usually shy nature make them difficult to spot (especially on rough weather days when they tend to disappear in the troughs between waves). Other whale species which are uncommon but regular visitors to our area include RIGHT WHALES, PILOT WHALES, HARBOR PORPOISES and ATLANTIC WHITE-SIDED DOLPHINS (White-sided dolphins are can be quite common in Spring and Fall, but are usually much less abundant in Summer). On very rare occasions we may sight a BLUE WHALE, SEI WHALES, SPERM WHALES, BELUGAS, and different species of DOLPHINS such as COMMON or BOTTLENOSE. All of these are exceedingly rare and so it is not likely to encounter them on a whale watch out of Gloucester. However, all have been seen on more than one occasion and so it is always possible. One of the great things about whale watching is that is a nature trip in the truest sense. The area we visit is not a zoo or an aquarium where animals are in cages or pens and trained to perform on command. We go out on the open ocean to look for wild animals. Wild animals are free to roam where they please and they do not adhere to our expectations as to where they should be found. The unexpected nature of the trip is a BIG part of what makes whale watching so exciting!